New for the summer, McDonald's has introduced Blueberry Banana Nut Oatmeal. It has plenty of juicy blueberries (about 1/4 cup), crunchy walnuts a hint of real banana, and two servings of whole grain (that’s 32 grams). All of that adds up to be only 290 calories per serving. Want to try it for yourself? Enter our reader giveaway to win 5 FREE coupons for McDonald's Blueberry Banana Nut Oatmeal. Fill out the form below by 11:59pm ET on 7/12/12. Good luck! a Rafflecopter giveaway Disclosure: I received free product coupons from McDonald's. Any opinions expressed are my own. I love nothing more than good oatmeal in the morning. 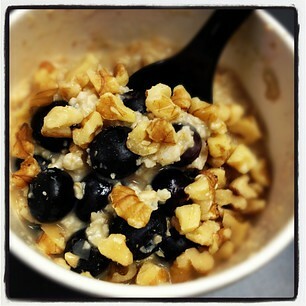 I've tried the other oatmeals at McDonalds, would love to try the Blueberry Banana Nut one too! I love love love Oatmeal. Would love to win this!! This looks delicious! Would love to try it. I have always wanted to try this since blueberries are my absolute favorite!!! I would love to try this oatmeal! Three little letters YUM, one Giant taste of goodness : ) YUM!